Read articles written by very well-known personalities and eminent authors about their views on Gandhi, Gandhi's works, Gandhian philosophy of Peace, Nonviolence and Conflict Resolution. Peacemaking According To Rev. Dr.Martin Luther King Jr.
Is There a Nonviolent Road to a Peaceful World? I am indeed honoured to have been invited by the Commandant, Vice Admiral S. Bhasin to present a lecture on ‘A Gandhian approach to International Security’ at this prestigious National Defence College. Though I have lectured at prestigious institutions all over the world this is the first time I am lecturing at a defence college. I greatly appreciate this opportunity to speak and interact with senior military officers from India and many friendly foreign countries. Gandhi is now such a global icon of nonviolence that not many realize he was a warrior. Erik Erikson, Krishanlal Sridharani and Richard Gregg have described his Satyagraha as “militant nonviolence”, “war without violence” and “moral jiujitsu” while Mark Jurgensmeyer affirms “Gandhi was a fighter. Whatever else one might say about him—that he was a saint, a clever politician, or a “seditious fakir” as Winston Churchill once put it—Gandhi certainly knew how to fight. In fact his approach to conflict resolution is one of his enduring legacies. In the same strain Harvard Professor Gene Sharp avers “Gandhi was an experimenter in the development of “war without violence”. His work was pioneering and not always adequate, but it represents a major development of historic significance both in ethics and in politics….. Many problems in its further development and application remain. But in words and action Gandhi pointed toward what may be the key to the resolution of the dilemma of how one can behave peacefully and at the same time actively, and effectively oppose oppression and injustice. Gandhi’s approach both to national and international security was rooted in his Truth and Nonviolence, Satyagraha strategy and in his fundamental belief that “the dignity of man requires obedience to a higher law—that of the spirit…. Mankind has to get out of violence through non-violence” He often quoted the Bhagavad Gita’s injunction ‘Satyanasti paro Dharma’ (There is no greater duty than adherence to Truth) and affirmed “Peace will come when Truth is pursued, and Truth implies Justice”. The latter requires that the opponent’s views be given due consideration and suitably embodied in the mutually acceptable agreement which should be the objective of all peace making efforts. “Three fourths of the miseries and misunderstandings in the world would disappear if we step into the shoes of our adversaries and understand their standpoint”. All actions which created suspicion, fear and anger in the opponent’s mind were to be averted and the contrary course adopted. This approach is embodied in UNESCO’s motto “Since wars begin in the minds of men, it is in the minds of men that the defences of peace must be constructed”. It is pertinent to recall that though fully engaged in India’s freedom struggle Gandhi never turned his attention away from the world and international security issues. He disapproved of the 1938 Munich agreement and wrote with prophetic foresight “The agreement that has been signed is a peace that is no peace. The war is only postponed. England and France have quailed before the combined violence of Germany and Italy”. About Hitler’s persecution of the Jews he wrote “My sympathies are all with the Jews. They have been the untouchables of Christianity.….. The German persecution of the Jews seems to have no parallel in history. The tyrants of old never went so mad as Hitler seems to have done. If there ever could be a justifiable war in the name of and for humanity, war against Germany to prevent the wanton persecution of a whole race would be completely justified. But I do not believe in any war”. His world view was broad spectrum. Having studied in England he had many friends there. In South Africa, where he spent 21 years, he experienced the most virulent racism. Among his early supporters there were two Jews. From them he learnt of the oppression of Jews in Russia. From Tolstoy’s ‘The Kingdom of God is Within You’ he became aware of the suffering of Russia’s peasantry. Gandhi’s patriotism, nationalism and internationalism were all very enlightened. He averred “I live for India’s freedom and would die for it. But my patriotism is not exclusive. It is calculated to benefit all in the true sense of the word. Through the deliverance of India, I seek to deliver the so called weaker races of the world…. For me, patriotism is the same as humanity. It is not exclusive. I am patriotic because I am human and humane. I will not hurt England or Germany to serve India”. He advocated friendship with all and made sincere efforts to promote mutual understanding, trust, good neighbourliness, universal brotherhood and peace. Gandhi had advocated nonviolent defence even when India was threatened with Japanese invasion in 1942. “If India were a free country, things could be done nonviolently to prevent the Japanese from entering the country. Nonviolent resistance could commence the moment they effected a landing. Nonviolent resisters would refuse them any help, even water. If the Japanese compel resisters to give them water, they should refuse and be prepared to die in the act of resistance, for it is no part of their duty to help anyone to steal their country.” This stand has been much ridiculed as absurd. Yet, this is exactly what the Russians did against Napoleon in 1812. They even burnt their historic and beloved Moscow to deny him and his troops shelter against the Russian winter. It worked admirably for them and more than half of Napoleon’s celebrated ‘Grande Armee” was decimated on its dispirited retreat from Moscow! Though Independent India summarily rejected Gandhi’s ideas on nonviolent national defence they have been received quite favourably abroad. The Norwegian government was the first to officially study the merits of civilian defence. The Galtung and Hansen Commission set up for this purpose in 1987 recommended ‘Total Defence’ whereby Norwegians would be trained for civilian as well as military defence. Paul Wehr writes “Social Defence as a concept originated in the ethical principles of the Gandhian movement and in pacifist ideology. The Gandhian movement demonstrated the power of massive non cooperation with an occupying power in that case Britain. As the destructiveness of modern war became more evident, it was natural that the principles and techniques of Gandhian non cooperation would be applied to the problem of national defense. At first social defence research was non governmental. By the 1970s Governments were supporting it and political parties and peace movements were debating it. The twentieth century has been the most blood-stained in human history. In the 20th century alone almost a hundred million people have been killed in the two world wars. The “9/11” terrorist attack on New York’s World Trade Centre in the 21st month of the 21st century, has dramatically changed the nature of armed conflict. It has ushered in the era of asymmetric warfare where the enemy is not a foreign state but a few suicidal terrorists, who strike from within rather than from outside the country and cause enormous devastation by using the host country’s own assets. The anonymous suicide bomber has become the defining symbol of our age. Martin Luther King’s words “the choice is either nonviolence or non-existence” are far truer today than when he spoke them. Gandhi foresaw the looming terrorist threat more than a hundred years ago. Startled by the youthful Indian revolutionaries he met in London in 1908 he wrote in ‘Hind Swaraj’ in 1909 and revealed that it was ,“written in answer to the Indian school of violence” and contained “the gospel of love in place of that of hate…It was an attempt to offer the revolutionary something infinitely superior, retaining the whole of the spirit of self sacrifice and bravery that was to be found in the revolutionary”. About the militant Indian nationalists he wrote “However much I may sympathize with and admire worthy motives, I am an uncompromising opponent of violent methods even to serve the noblest of causes…..Acts of violence create bitterness in the survivors and brutality in the destroyer …..The bomb now thrown at Englishmen will be aimed at Indians after the British are there no longer.” If Gandhi’s “offer” is accepted by present day fundamentalists, revolutionaries and jihadi suicide bombers, their respective agendas would be far better served and the world would be an infinitely safer place. That this “offer” was made almost a hundred years ago, is a measure of Gandhi’s extraordinary foresight. That, in stiff competition with various groups of revolutionary nationalists, he succeeded in inducing the Indian National Congress and the vast majority of Indians to adopt his nonviolent strategy is his greatest achievement. Prof. Johan Galtung extolls him thus ”Gandhi was certainly a revolutionary, much more revolutionary than the piecemeal revolutionaries of Western civilization…..Gandhi revolutionized revolution itself”. Another serious security threat confronting our contemporary world is the proliferation of nuclear and other weapons of mass destruction. Gandhi’s view on nuclear weapons was clearly stated in the tragic aftermath of their drops on Hiroshima and Nagasaki. He declared: “The moral to be legitimately drawn from the supreme tragedy of the bomb is that it will not be destroyed by counter bombs……Unless the world now adopts non violence, it will spell certain suicide for mankind.” Albert Einstein echoed the same sentiments stating “The unleashed power of the atom has changed everything but our thinking; thus we are drifting toward a catastrophe beyond comparison. We shall require a new manner of thinking if mankind is to survive”. Gandhi and Einstein were on the same mental and moral wave length as far as international security and mankind’s survival are concerned. The question is often asked: “How does one face a situation of nuclear blackmail without nuclear arms of one’s own? The simple answer is: in the same way that the non nuclear north Vietnamese faced a nuclear armed America and subsequently a nuclear armed China, coming out victorious on both occasions: in the same way in which the non nuclear Egyptians successfully confronted a nuclear Britain over Suez; and in the same way in which a non nuclear India under the intrepid Mrs. Gandhi coolly faced the nuclear blackmail from the United States during the 1971 Indo-Pakistan war, and enabled Bangladesh to achieve independence. In all these cases the Gandhian maxims that it is Right rather than might, fearlessness rather than cowardice and indomitable will rather than armaments carried the day. Gandhi had foreseen the ecological crisis that the profligate life styles of the West would create. He wrote “A certain degree of physical comfort is necessary but above that it becomes a hindrance. Therefore, creating an unlimited number of wants and satisfying them is a delusion and a snare….I make bold to say that the Europeans will have to remodel their outlook if they are not to perish under the weight of the comforts to which they are becoming slaves”. He also wrote “Earth provides enough to satisfy every man’s need but not for every man’s greed. …..The wars of our times spring from greed.” During his lifetime many considered his emphasis on the simple life and reduction of one’s wants as antediluvian. However the eminent economist Ernst Schumacher appreciated it and writing about Gandhi’s ecological wisdom wrote “Gandhi had always known, and rich countries are now reluctantly beginning to realize, that their affluence was stripping the world. The international Green Movement acknowledges Gandhi’s inspiration. 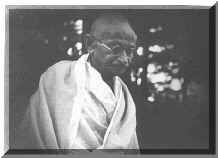 Petra Kelly, a founder of the German Green party, has publicly asserted: “In one particular area of our political work we have been greatly inspired by Mahatma Gandhi. That is in our belief that a life style and method of production which rely on an endless supply and a lavish use of raw materials generates the motive for the violent appropriation of these raw materials from other countries. In contrast, a responsible use of raw materials, as part of an ecologically oriented life style and economy, reduces the risk that policies of violence will be pursued in our name”. Even a cursory survey of the global scenario in the last ten years reveals that the major problem the world, many nations, corporations and communities suffer today are because their leaders deserted the path of Truth, justice and nonviolent conflict resolution in pursuit of national, corporate, religious or personal agendas. The consequences have been disastrous. Wars in Afghanistan and Iraq, terrorist attacks in Nairobi, Dar es Salaam, Aden, New York, Washington, Moscow, Bali, Istanbul, Tel Aviv, Rabat, New Delhi, Mumbai, London, Sharm al Sheik and Amman, the impeachment of a US President, conviction of an Indian Prime Minister, indictment of the Chilean and Peruvian presidents, expulsion of eleven members of India’s Parliament, bankruptcies of Enron, World Com, Marconi, Tyco and Parmalat, and. The imperative need for trustworthy leaders of integrity in all walks of life has never been greater than now. President Anwar Sadat may or may not have been inspired by Gandhi but in 1977 he acknowledged the truth that Egypt’s 1948, 1967 and 1973 wars with Israel (in the last mentioned of which Egypt had notable initial success) were disastrous for it. He abjured war and took the path of non-violent conflict resolution. He made his historic journey to Jerusalem in November 1977. This opened the door to negotiations with Prime Minister Menachem Begin and led, with President Carter’s good offices, to the historic Camp David Accord of September 1978. In March 1979, Egypt and Israel signed a peace treaty that formally ended the state of war that had existed between them for 30 years. Soon thereafter, mutual diplomatic relations were established. By June 1982 Egypt regained from Israel all territory it had lost since the 1967 war. In 1991 Jordan’s King Hussein took the same path as President Sadat and also secured a peace treaty and diplomatic relations with Israel. These successes clearly establish that the good neighbourly and nonviolent conflict resolution path can lead to mutually acceptable solutions to even the most difficult international problems. I shall conclude by recalling Abraham Lincoln’s words “Force is all conquering but its victories are short lived” and Napoleon’s sad reflection at his remote Helena Island prison “Glory is fleeting, obscurity is forever. There are only two powers in the world—the spirit and the sword. In the long run the sword will always be conquered by the spirit”. Text of the lecture on ‘A Gandhian approach to International Security’ made by Ambassador (Retd) Alan Nazareth at National Defence College, New Delhi on May 1, 2008.